Where is the local historic preservation organization on this one? This is geographically within their wheelhouse. Eon Blue wrote: Where is the local historic preservation organization on this one? This is geographically within their wheelhouse. it's also in the zone for the development moratorium. wouldn't you think it would have prevented demolitions? KCTV reported that a meeting on 'Development in Westport' will take place Feb. 1 (this Thursday) at 5:30pm at the Westport Presbyterian Church, 201 Westport Rd. I can't find any more information on the meeting, but assume it has to do with some of the anti-development efforts recently. I hope to make it - any others planning on going? Besides the 2/1 meeting there is also a meeting on 2/6 at 6:00, at Westport Presbyterian. I thought that there were three meetings but I can't find any info about that. These meetings are to present the plan that stems from the $25k survey of Westport that HKC paid for and is done in collaboration with the WRBL, KCMO Planning, and Councilperson Shields. They have been pretty poorly advertised, with the city saying it's not up to them because it's not their plan (though they finally sent out an email on Friday), and WRBL/HKC publicizing largely to their members. Make of all that what you will. I will be there at the 2/1 meeting. Sounds like the 2/1 meeting is the public meeting for the Westport Dev. plan. & the 2/6 meeting is the public meeting led by HKC to present the historic survey results. If you had to guess, why isn’t the survey available at the first meeting? chaglang wrote: If you had to guess, why isn’t the survey available at the first meeting? Too much info to digest in one meeting. The historic data and dialog probably deserves its own dedicated time. I went to the meeting last night - anyone else? Didn't know what to expect, but was pleasantly surprised. The meeting was hosted by Gould Evans, who sponsored the study (along with Historic KC and some neighborhood group), and had a wide focus - housing stock, density maps, drainage topography, business/service breakdown, etc. This will be the first of several meeting aimed at drilling down into the Midtown Plaza Area Plan and possibly looking into an overlay district. There was a good range of people there, and many under 40. Each subsequent meeting will further define what residents, business owners and neighbors want in the area. I was there. 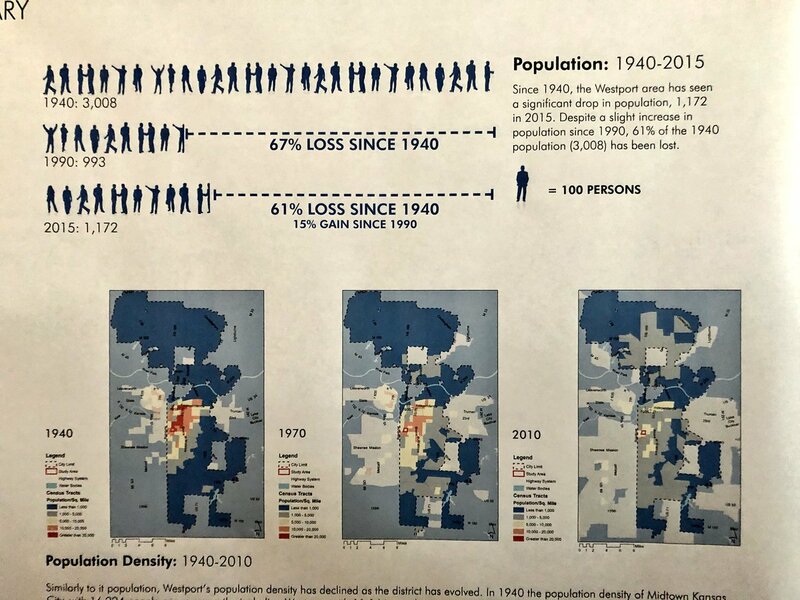 A nice overview and reminder of how much density has been lost since the neighborhood's peak. It was a good meeting; I was also pleasantly surprised. AFAIK nobody has ever amassed the quality or depth of research on Westport as what we saw last night. The data was a little like a Roarschach Test: everyone looked at it and found something to support the ideas they came to the meeting with, which in itself probably says something significant about Westport. There will be a meeting at 5:30 (?) on 2/6 at Westport Presbyterian to present the findings of the historic survey, which looks like it will be another Roarschach Test. The end product effort of this is still an open question and it will be interesting to see what shape it takes. chaglang wrote: It was a good meeting; I was also pleasantly surprised. AFAIK nobody has ever amassed the quality or depth of research on Westport as what we saw last night. The data was a little like a Roarschach Test: everyone looked at it and found something to support the ideas they came to the meeting with, which in itself probably says something significant about Westport. I agree. But I do think the meeting on 2/6 (presented by Historic KC) will have a little more slanted toward preservation, which makes some sense. One of the charts last night highlighted property that was deemed eligible for historic preservation, and I was a little leery with some (Wesport Manor apartments at 40th/Penn?? ), but chalked it up to me not always having an eye for what deserves preservation. Also, I asked one of the facilitators last night (who happened to be from HKC) where I could find information about future planning sessions or access to the presentation online and she looked at me like I was crazy. She ended up suggesting that I call Gould Evans. The eligibility for national register listing may just be that a building is 50+ years old. What was the point of that meeting? KCPowercat wrote: What was the point of that meeting? Justification for a development moratorium. ^It depends on who you ask. I suspect that HKC would like to see a preservation overlay of some kind. I don’t know what WRBL wants out of it, but based on the 9 story hotel project I suspect there are large property owners in the WRBL who may not want an overlay. But I would be surprised if after all the fees for the study and planning all that came out of it were non-binding development recommendations. That’s why I said that it will be very interesting when they get to the stage of drawing lines in a map. Those will be the meetings you really want to be at.